Games are a great way to connect with your kids. We scoured the net and found ten of our favorite games that your can make and play with your children. Pinball – create your own game – Such a fun way for kids to experiment with angles. As your kids move the pieces they are learning how to navigate an item/ball with geometry. Farkle – its a great classic game. Make a game set to play on the fridge. 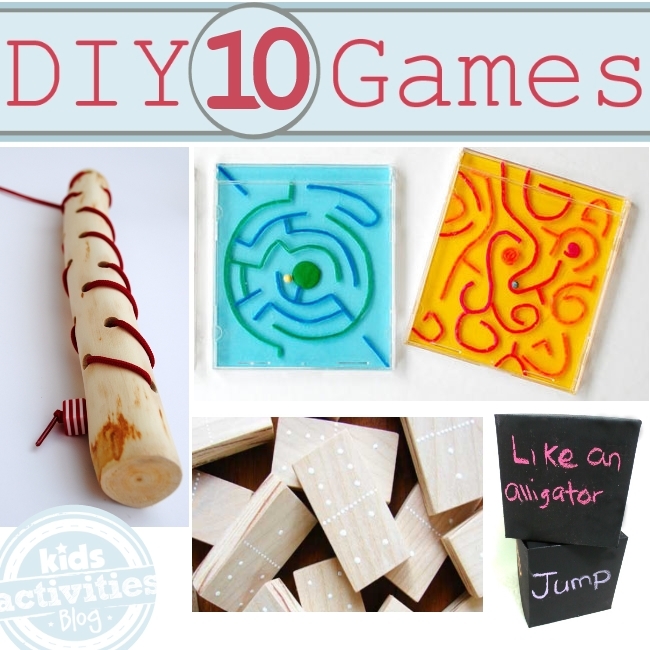 Create a collection of mazes for your child to puzzle through. All you need are empty CD cases, sticky sticks and a tiny ball. Your kids will love to create new faces or other “works of art” with felt shape set. Use a CD case to store and transport this toddler game. Use scrap wood to make a set of dominos – this set is adorable. Make a game board for your kids to play a round of tic-tac-toe, using river rocks as the playing pieces. Giant Game board – Have your child think of things that are fun to do – silly ways to smile (ex: Make crazy faces, do the chicken dance, jump on one foot, give a kiss, etc.) Roll the dice to pick the next activity. Make a recycled “arcade game” from TP and papertowel tubes – and use a collection of pebbles as the game pieces. Have your kids stack the tubes and toss the pebbles in for points. Learn where the continents are in a fun game of Earth Twister! Create your own map/game board with paint and a sheet of vinyl. Add a level of complication for older kids and ask them to find countries. Giant Jenga Blocks – be careful, as you pull these wood blocks out it can topple on top of you! Thank you for including my tutorial on Backyard Giant Jenga. We had a lot of fun playing it over the summer and the boys even used the pieces as giant building blocks for their trucks and outdoor toys. I can’t wait to try some of the other ideas you featured. 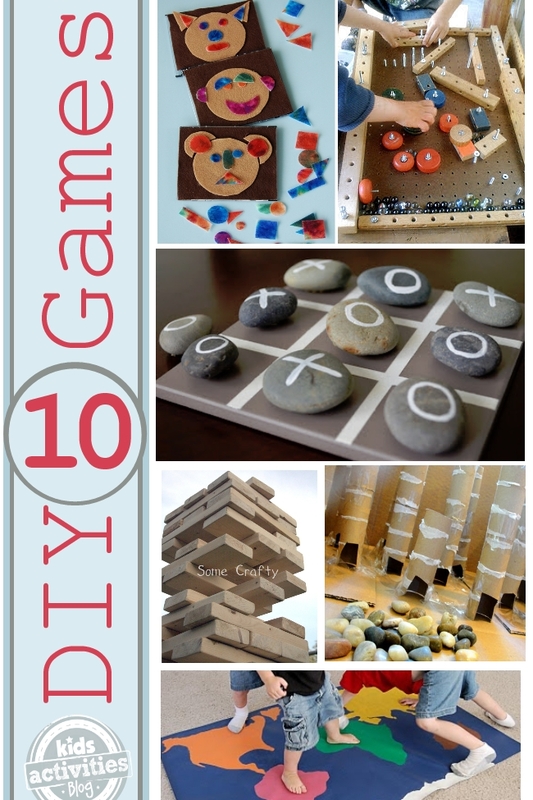 These are creative DIY games to make and play with children indoors this winter season. Our favorite is the recycled arcade game! We will be tweeting your DIY activities to our followers from our Twitter account, @OncorPML. Thanks for sharing this with us! Thanks for including a link to my FARKLE instructions! All these game ideas are superb to make children happy and active. All ideas are wonderful but i like “Giant Game board” too much. Its a best game idea for kids.